The Shopping Our Stash SOS #362 is Christmas in July, so I made a Christmas card to play along. The flowers were done with a Sweet'n Sassy Stamp set I've had for years and don't often use, but I dug it out of the cobwebs and made a card with it. I colored the image with Copics and a yellow glaze pen, then covered the entire piece with Versamark ink and heat embossed it with clear detail ep. I fussy cut the image out and placed it on a white piece that was embossed with a Taylored Expressions poinsettia ef and sponged with colored chalks in red and green. The sentiment is by SU! Teeny Tiny Wishes and was heat-embossed with gold ep on a black panel. The final touch was to add a twine bow and some red gemstones before placing it all on a dark green cardbase. I'm also going to share this with Craftyhazelnut's Christmas Challenge 394 which is anything Christmas with an option of using a die-cut or a punch. Christmas is going to be here by the time we blink our eyes a few more times, so I figured I'd best get some cards made ahead of schedule. Thanks for stopping by and I wish you a wonderful Friday and a great kick-off to a fun weekend as well. 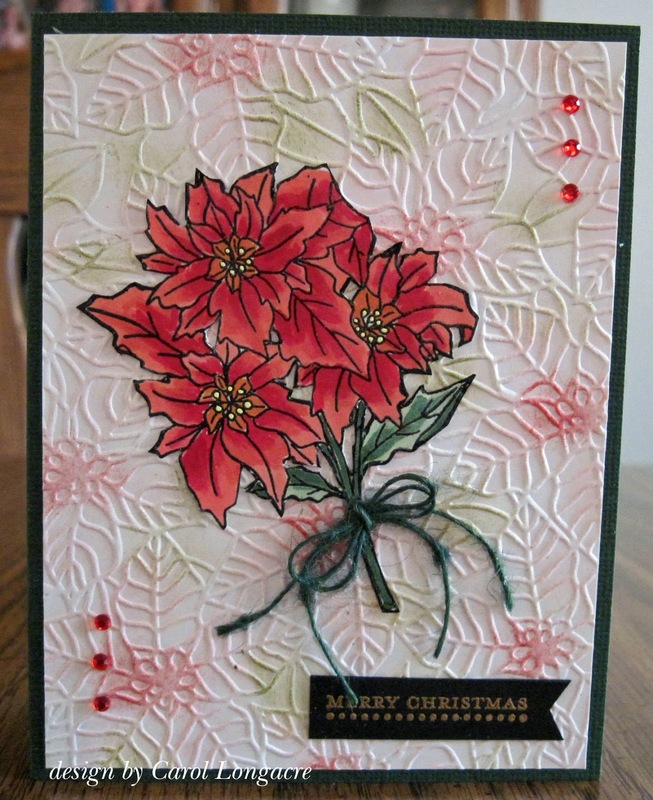 Another pretty card with that beautiful bouquet of poinsettias. Love the embossing in the background too. Yes, Christmas really isn't far away now. This stamp certainly deserved an outing - great card even though it feels too hot to be thinking Christmas!! 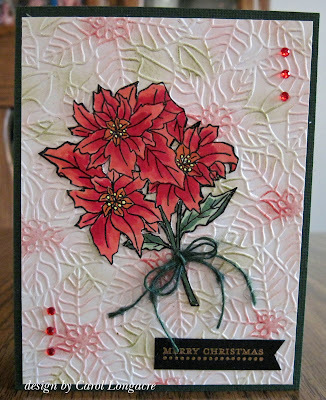 A fabulous Christmas card Carol, a beautiful poinsettia image and lovely embossed background. This is outstandingly beautiful! I love the main poinsettia but I also love the way you did the background to show it off. So wonderful in every way! Love your colouring on the poinsettias and the cute twine bow! That embossing folder is super gorgeous! I love the touches of chalks you added. Brilliant! That's a neat stamp and you did a great job coloring it! Like Brenda said in a comment before mine...You should have dusted off the cobwebs way before this. I've been to your neat and tidy house and I certainly didn't see any cobwebs there...My house on the other hand...smile.